Start the Process and Order Your Personalized Koozie Today! Express Imprint carries one of the largest collections of exclusive custom koozies, cooler products that you'll find anywhere. All of our custom koozies can be personalized with logos, images or text so your guests will carry your message home with them. It’s Easy to Order Custom Koozies Online! Are you looking for custom koozies that will WOW everyone at your next party or event? Look no further! We offer the best personalized koozies on the market! Explore our user-friendly designer tool which allows you to browse our vast selection of custom koozies! Select the size, style, and colors that you love - make it fun! You can add custom text, clip art, photos - anything you can imagine to make the best custom koozie you want! There are even premade templates for a variety of occasions such as birthday koozies and wedding koozies for your convenience! The entire process takes only three minutes, and we have friendly, helpful staff members ready to assist you if you have any questions. Our factory-direct wholesale pricing, fast shipping, expert staff make it easy to order a custom koozie or can/bottle coolers in just minutes, for memories that will last for years. Design your personalized koozie now! It wasn’t that long ago that can coolers and Koozies® were only seen occasionally, at backyard barbeques or tailgating parties. Now, they’ve become a must-have item for just about any informal gathering: they look great and they’re the ideal way to send a brand, logo or message home with guests. What was once just a “cool idea” is now an important ingredient in just about every marketing campaign. People will use their personalized koozies regularly, and every time they do they’ll see a reminder of your company or event. There is no time like now to promote your brand using customized products, especially awesome koozies. Our can coolers make great and inexpensive giveaways for your sales staff-- at show booths and in outlets that carry your other products. Whether you want a Koozie® that fits a standard soda or beer can, a long-necked bottle, a water bottle or even a cup of coffee from the local coffee shop, we have the size, style, and color right here; and it is your own, personalized koozie! 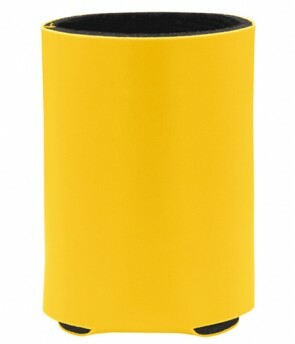 In our collection of Koozies®, the most unique is the long-necked bottle cover with a zipper running up to the neck to keep the beer or water bottle cold. We specialize in collapsible (fold flat) coolers that make it easy to store them in a drawer, coat pocket, backpack or purse. These units are available for standard soda/beer can sizes - including the 20-ounce. The Carabineer Koozies® are perfect for hiking, jogging, bicycling or kayaking. You can clip the carabineer onto your belt, a bike loop, backpack or bungee cords while fishing or kayaking! Now there is no need for any company to settle for boring when it comes to marketing their services or products. You can easily print your business info by using our design online tool. Can coolers are neoprene or foam sleeves that wrap around hot or cold drinks! They have also been designed to be able to keep your hands from getting damp while keeping the temperature of the cold drinks regulated. These simple yet effective items can be completely customized without them costing an arm and leg. One of their main advantages is that they are such an affordable means of advertising that almost any business can make use of them as promotional items. They can be distributed at shows, weddings, schools, product launches or even sporting events. Your imagination is the limit with the wide variety of items we carry that are made to order when you design them online, you are sure to find a can cooler or Koozie that will suit just about any occasion. Custom koozies are also the ideal way to get your company logo noticed at an affordable price, which is why they are the ideal for any trade show booth, company picnic or other corporate events. How fast can I get Koozies delivered? At Express Imprint our standard production is 5-7 business days. You can check the estimated delivery date on the checkout page. Need your order faster? No worries we offer a free rush service at no cost to you. Just contact us! Do can Koozies fit bottles? Our custom can coolers and koozies do fit bottles. The fit is not very snug since the diameter of a can and bottle are different but many of our customers do use can koozies on bottles and they look great. What are Koozies made of? Each koozie we sell is different but we offer custom printed koozies made from Indestructible Foam, neoprene, vinyl, scuba foam, polyurethane foam and cloth. Can I create my own personalized koozies? Yes! At Express Imprint you can design your own personalized koozies within minutes using our online designer tool. Choose from a large collection of koozies, materials and ink colors to get the perfect item for your event. Each item is different but we try and set our minimum quantity as low as possible. Check out the product page for the minimum quantity which ranges for 5pcs to 50pcs. Do you have made in the USA Koozies? We are one of the few companies that sell made in the USA customized koozies that are manufactured and printed in the USA. The quality and workmanship of these coolers are great. Look for the made in the USA seal! Can koozies for wedding favors? Looking for personalized coolers for your wedding? Check out our wedding koozie templates for inspiration and wedding koozie ideas. What kind of custom koozies do you recommend for weddings? For weddings, we highly recommend choosing a high-quality versatile koozie that can be used for bottles and cans. The premium can cooler has been chosen by our customers over any other and is the go wedding koozie. Susan R : "I have ordered from Express Imprint for four years in a row! quick and easy." Susan R : "Will definitely order again! Items came out great!" Andrew L : "Loved the quality of the cups and can koozies. Thanks for the free rush service!" Reggie K : "Been using Express Imprint every year for our family reunion, I still have koozies that are 10yrs old that have held up great." Sarah L : "no comment"